In 1996, McDonald’s had in place a locksmith call-out system for their corporate restaurant locations. In each area of the country, different systems where set up along with different vendors to meet the locksmithing needs of McDonalds. At the time it was corporate policy to have all of the door locks replaced when a key holder left the organization. The regional security managers would have to then locate and call out a locksmith to go to the site to replace all of the door locks and turn over new keys to the staff. This would require calling in the key holding staff to receive these new keys. It was a costly program, not only in the expense of the service and materials, but to the amount of time that the McDonald’s employees would spend in completing this task. Due to reports from the field, along with numerical evidence on the inefficiency of this type of program, McDonald’s corporate security began researching different vendors for a solution that could reduce the cost of the program, tighten up their security concerns, and have a nationwide single sourced solution. 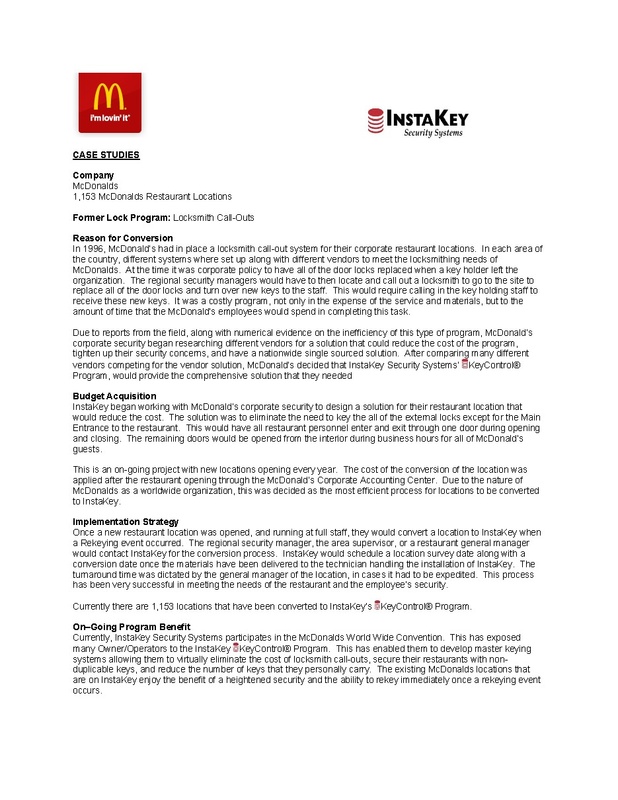 After comparing many different vendors competing for the vendor solution, McDonald’s decided that InstaKey Security Systems’ Key Control Program, would provide the comprehensive solution that they needed.